Song of a Black-sided Meadow Katydid, ©Wil Hershberger 2017. 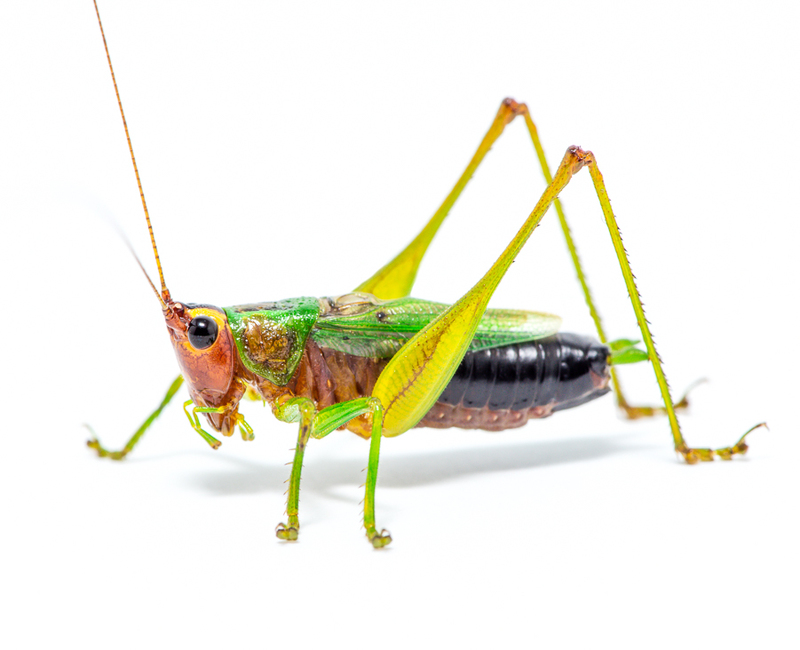 Aptly named for the jet-black sides and top of the abdomen, the Black-sided Meadow Katydid is an inhabitant of freshwater wetlands. The face of this species is rather distinctive with a reddish-brown color except for yellow around the eyes creating a spectacled look. The pronotum appears clear except for bright green borders. The wings are also bright green with a dark stridulatory field in the male. 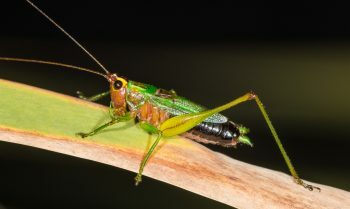 The cerci of the males are bright green. They are most easily seen at night when they venture up into the vegetation looking for seeds to consume. Adults can be found from early August last probably to frost. 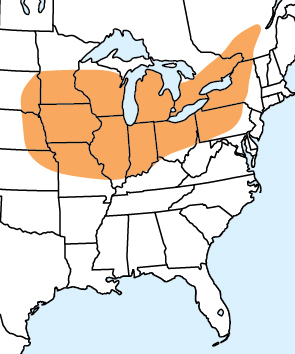 Range Map for Black-sided Meadow Katydid. Black-sided Meadow Katydids are found from eastern New York west to eastern South Dakota then south to northeastern Kansas and east to south-central Pennsylvania. Song: The song is a continuous purring, lispy trill with a two-parted quality. 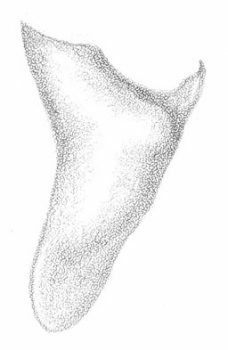 In fact, the song is a continuous train of units each composed of a brief noisy pulse, followed immediately by 20 or so ticks with an ever-decreasing rate of delivery, lasting all of 70 milliseconds (see sonogram below). This pattern is distinctive to the species. Sonagram of Conocephalus nigropleurum song.